Jiangsu Vocational College of Information Technology in Wuxi, China was just approved to offer its students ETA International’s certification for electronics technology. It has taken two years for ETA International to form a joint partnership with the school and ETA recently made an official visit to formalize the partnership. Dr. Ruifang Cao; ETA President Teresa Maher; ETA Secretary Chris Miller; JSIT Electronic Information Engineering Institute Vice Secretary Han Wu; and JSIT Dean of Engineering Institute Zhen Bang Xu. Jiangsu Vocational College of Information Technology (JSIT) was very interested in a certification program tied to electronics and technology. That’s where ETA’s Associate Certified Electronics Technician (CETa) certification could make a difference and fit in to the exchange. ETA International currently has Certification Administrators in India, Trinidad, Cayman Islands, Canada, England, Bangladesh, Saudi Arabia, South Africa, Singapore, Chile, Ireland, Guyana, Jamaica, Marianas, Japan, Netherlands and other overseas locations. Until now, the association didn’t have any active testing agreements in the People’s Republic of China. But that is about to change! What prompted ETA Internationals’ recent trip to Wuxi, China? ETA Executive Secretary, Professor Chris Miller, CETsr, of Heartland Community College in Normal, IL proposed the idea of working with schools in China. His proposal was based on a strong educator exchange program initiated at Heartland CC and other colleges in both the US and China by Dr. Ruifang Cao, who has been with Heartland CC for over 20 years and has influenced multiple successful teaching exchanges. After sending a delegation of administrators to Heartland CC, Jiangsu Vocational College of Information Technology (JSIT) was very interested in a certification program tied to electronics and technology. That’s where ETA’s Certified Electronics Technician Associate (CETa) certification could make a difference and fit in to the exchange. Adding the value of ETA certification to their degree program was very appealing to JSIT, so the wheels began to spin to make that happen. The school applied for ETA Course Approval to offer the CETa certification exam to its students. Then, as a part of a delegation from Heartland CC and JSIT’s exchange program, one of JSIT electronics professors, Enliang (Eric) Wang, visited the ETA offices to discuss his school’s application and approval, Certification Administration procedures, online testing and ways that the cultural and communication barriers could be overcome. After months of details, translations and fine tuning, an invitation by JSIT President Wei Ping and Vice President Sun Ping was extended to ETA International to visit the campus in China. Several days of meetings were arranged for an ETA delegation made up of Miller, Dr. Cao and ETA President Teresa Maher, CSS. With the help of a translator, presentations were made by both JSIT and ETA. Previously translated documents were utilized, classes were toured, instructors were queried, equipment reviewed and curriculum acknowledged. An exhibition of student flying demonstrations, after drone building, was happily made without a single failure of hand-soldered circuit boards or equipment. Safety practices were evaluated, ETA’s online testing system was practiced, and revisions to the school’s online testing security were planned. A final day of agreements and translations resulted in a signed Memorandum of Understanding with much official photography and goodwill all around. The idea of JSIT working with ETA’s certification program that began nearly two years ago has finally come to fruition! To say that Jiangsu Vocation College of Information Technology was a generous and accommodating host is to underestimate the lengths that were taken to ensure our ability to break the language barrier, as well as to demonstrate unbridled hospitality. Frequent signs across the 1,300 acre campus welcomed ETA, and “Xiexie” was a part of nearly every conversation. The school houses many pieces of industry equipment implemented in training practices, and has its own working manufacturing, electronics, IOT, marketing and sales training segment, which was very flooded with students hard at work. All students stay on campus, along with many of the instructors, so every building was buzzing with activity. 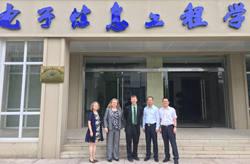 Heartland CC met with an additional school in China that would like to implement ETA certification and the potential to increase the different types of certification offered certainly exists. ETA will work to increase the INTERNATIONAL in our association name - ETA INTERNATIONAL.